Driving past the somewhat nondescript building at 724 South El Camino Real it is hard not to notice that, while the basic structure of the building remains the same, there have been some definite changes. If you’ve lived in San Clemente any length of time you are probably familiar with the address. Old-timers may remember when it once served as a bank. Those newer to town probably recognize it from the days when it was an auto parts shop. And many people may be most familiar with the parking lot as the place for an emergency stop when you were driving by and the smell of Kentucky Fried Chicken became too strong to resist. 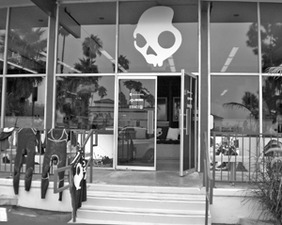 Passing by today you will notice that the parking lot is full of cars loaded with surf racks, that there is a glimpse of a storefront filled with shiny objects and hip clothing, and the outside of the building is adorned with giant silver skulls and a prominently placed Skullcandy logo. If you’re not familiar with the Skullcandy brand, ask the nearest 14-year-old and chances are you will get an immediate answer. One of the fastest growing businesses in the Action Sports Industry, Skullcandy is the maker of earphones for use with those ubiquitous iPods, iPhones and other MP3 players that many people would no more think of leaving home without then they would their house key. First developed by entrepreneur Rick Alden, Skullcandy launched in 2003 with a line of headphones and earbuds in bright colors and skater style patterns. 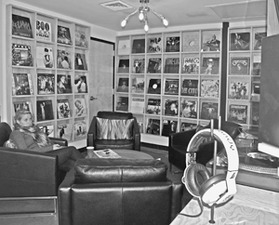 Initially the company, which is based in Park City Utah, concentrated on marketing the headphones specifically to the snowboarding crowd, but it didn’t take long to make inroads in all of the action sports, from surfing to skating to motocross to mountain biking. Today Skullcandy boasts partnerships with some of the most well-known action sport stars, and provides sponsorship of many up and coming athletes as well. Their partnerships range from as far afield as the National Basketball Association to the rock band Metallica. Local surfers like the Gudauskas brothers and Kolohe Andino currently ride for Skullcandy. The company’s amazing success is what has led to the expansion of their corporate offices and specifically opening their new location in San Clemente. Although the changes to the outside of the building may not be too extreme, the remodeling of the inside is nothing short of remarkable. The first thing you notice is a prominently placed skateboarding half pipe taking up a substantial section of the room. Walls are decorated with surfboards, snowboards and skateboards all signed by some of the best known riders in the industry. Work spaces are open and modern and everything has the feel of a very cool and laid back work environment. The break room is lined with classic record album art and a large screen TV plays the latest surf and skate videos. Downstairs features “The Boardroom” where walls are lined with used surfboards, foam boards, body boards and wet suits in a myriad of sizes. Guest and employees visiting from the Utah office are free to help themselves and have their own “San Clemente” experience. Showers and changing rooms are available so that employees can spend their lunch break surfing at Riviera Beach. When the surf is particularly pumping employees are actually encouraged to come in a bit late after taking advantage of one of the local surf spots. But make no mistake, this is a group of hardworking professional marketers who are contributing to Skullcandy’s continued growth in a very competitive market. Although most of the building is given over to office space, there is plenty of appeal for the local customer. Open from 9:00 to 5:30 Monday through Friday, the Skullcandy store front is well-stocked with the latest Skullcandy products. The walls are lined with earbuds, headphones, sweatshirts, beanies and back packs. Kids are encouraged to stop by and pick up a free sticker or wristband and there is always a chance they might run into one of their favorite team riders who frequently stop by the building to watch movies, skate the half pipe or just hang out. But that is just the beginning for customers lucky enough to live in the nearby area. Just by sending an email to scpacific@skullcandy.com, locals will receive invitations to special community events, including skate nights, movie nights, and meet and greets, as well as great deals on products in the Skullcandy store. Locals may be able to score invitations to events like the recent filming of Fuel TV’s “Built to Shred” which took place in the Skullcandy parking lot this summer. Scheduled to air on November 14th , the show features professional skateboarders using everyday junk objects combined with skate ramps to make skateable obstacles. The episode will also feature the “Built to Shred” crew installing the skate ramp into the Skullcandy office space.